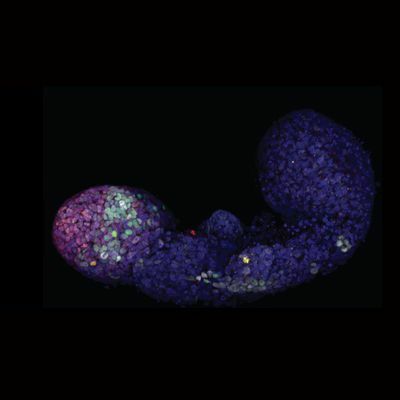 With just a molecular nudge, aggregates of embryonic stem cells take shape as a “gastroloid,” bearing the genetic hallmarks and spatial organization of early development. 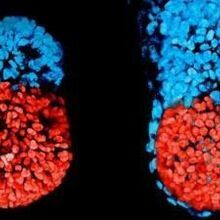 Clumps of embryonic stem cells given one brief molecular stimulation start arranging themselves in a way that resembles a mouse embryo, down to the timing of when the cells switch on particular developmental genes, according to a report in Nature today (October 3). 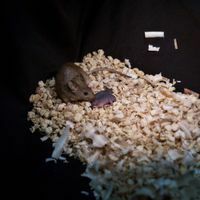 The reproducible formation of these so-called gastruloids could make them a potentially valuable resource for research and reduce the number of animals used in experimentation. To understand how the inner cell mass becomes an organism, Martinez Arias and colleagues have been attempting to recreate the early steps of embryogenesis with cultured ES cells. 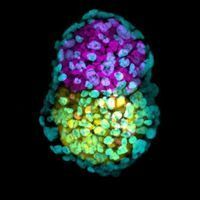 Their latest effort, described today, has resulted in structures with similarity to gastrula-stage embryos—the period in development where distinct cell types begin to develop and the body’s axes are laid out. In these gastruloid structures, “early axis specification and 3D pattering of the embryonic tissues is now quite well recapitulated,” says Niels Geijsen of the Hubrecht Institute in the Netherlands who was not involved in the research. To make their gastruloids, Martinez Arias and colleagues take clusters of approximately 250 ES cells suspended in culture medium and briefly treat them with a molecule that activates Wnt signaling—a pathway known to be essential for body axis specification in the early embryo. This one trigger is sufficient for the cell clumps to elongate and to establish patterns of gene expression along their anteroposterior (head-to-tail), dorsoventral (back-to-belly) and mesolateral (left-to-right) axes akin to those seen in mouse embryos of equivalent developmental age. The gastruloids do not recapitulate the most anterior (head) end of the embryo, which is known to require Wnt inhibition. “When we compared the patterns of gene expression over time and space with [that of] embryos we found very large similarities,” Martinez Arias says. In particular, “the molecular data for the Hox genes is pretty compelling,” says stem cell and developmental biologist Ayreh Warmflash of Rice University who was not part of the research team. The Hox genes encode a large family of transcription factors that are activated by Wnt signaling and control the body plan of the embryo along the head-to-tail axis with each family member being expressed at defined zones along that length. Remarkably, this ordered expression was evident in the gastruloids. It’s as if Picasso decided to become an embryologist. While gene expression in the gastruloids mimics that of the embryo, the architecture of the tissues does not. Instead of defined morphological boundaries between tissue types, “it’s as if Picasso decided to become an embryologist,” writes Briscoe. 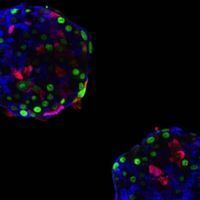 L. Beccari et al., “Multi-axial self-organization properties of mouse embryonic stem cells into gastruloids,” Nature, doi:10.1038/s41586-018-0578-0, 2018.